Innovation in gaming is often held up as the holy grail of the industry, by developers and players alike. Dana Massey looks at the state of gaming, and where innovation may come from in the future. Current gaming is limited to only three senses: sight, sound, and - in a limited fashion - touch. Robert Coker explores the world after we tap into taste and smell, and what it could mean for gaming. Though recently arrived on the grand stage of gaming, it's no question that massively-multiplayer games will have a profound place in the future. Jim Rossignol gives his take on where the future of MMOGs will lead. Like alcohol and rock and roll in previous generations, gaming is becoming a legal talking point in this one. Joe Blancato paints a picture of a dystopian future, then discusses how this could actually happen. It's easy to be floored by flashy graphics and the latest tech, but even the brightest sparkle doesn't help a title that's simply "okay." 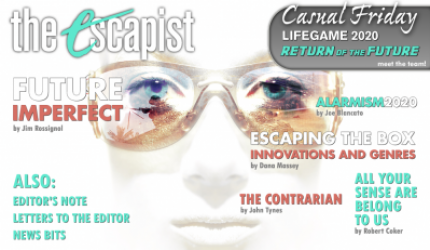 In this edition of The Contrarian, John Tynes explains that the game's the thing. "Today I finally changed shopgames. It felt like converting to a new faith." Allen Varney takes us to a strange future where gaming has completely integrated itself with capitalism and commerce. Shawn Williams predicts that the more accurate and realistic violent video games become, the less entertaining they will be for children. See his vision of a future where gamers reject the cutting edge and rebelliously return to their roots.